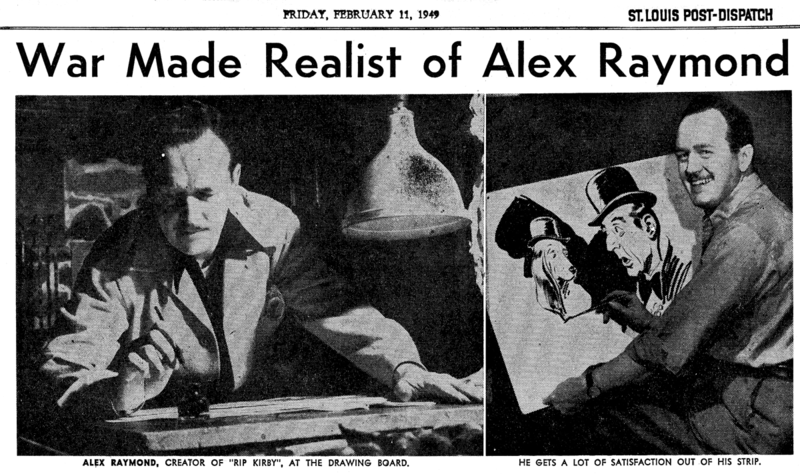 Alex Raymond, the versatile artist who draws the popular adventure strip, "Rip Kirby," in the Everyday Magazine of the Post-Dispatch, came home from two years of fighting in the Pacific with some pretty definite ideas in mind. One idea was that while there is plenty of dough to be had in "escape" comics, he'd rather take less money and draw something that "helps reflect accurately the age in which we live." "The war made a realist out of me," says Raymond, who looks more like a bond salesman than a creator of one of the most successful adventure comics on the market. "I lost my taste for the fantastic out in the Pacific. I came home determined to do something modern and real." When Raymond enlisted in the Marines, he was already at the top of the comic art profession. For years he had been drawing "Flash Gordon," that futuristic portrayal of the blond young hunk of man who whips around distant planets with his girl friend Dale. But Raymond wasn't satisfied. "Call it patriotism if you like," Raymond says a little apologetically, ''but I just had to get into this fight. I had three kids. I wasn't young. And comic artists were getting easy deferments because they were considered necessary for morale at home. But I've always been the kind of a guy who gets a lump in his throat when a band plays the Star-Spangled Banner and the flag goes by. Anyway, I got in it and I got out of it with a whole skin. I came back a different guy. And I wouldn't take a million bucks for the experience." 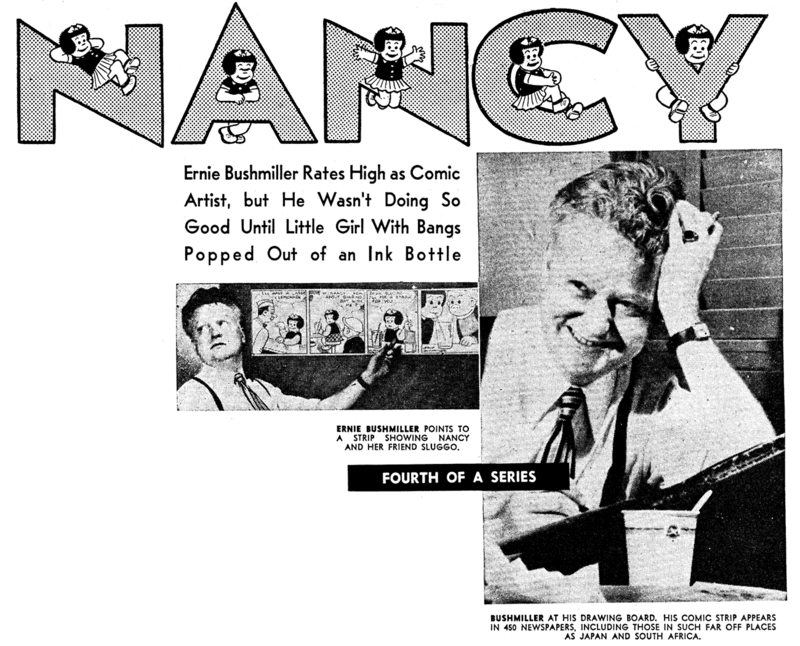 Back from the fighting with Raymond came Rip Kirby, the American professor - detective whose adventures are now printed in more than 300 newspapers throughout the United States and who has brought his creator, Alex Raymond, a lot of hard work but even more satisfaction. "Rip is pretty difficult to do," says Raymond, an able and meticulous draughtsman. "I spend one day and night on the continuity. Then it takes me three days to pencil in a week's strips and another day to a day and a half inking in. I work three weeks ahead and I never seem to get ahead of myself. There's an awful lot of drawing in the strip." Raymond's Rip Kirby has had a phenomenal success since it started just about four years ago. In addition to several other foreign papers, it is carried in the newsprint-short London Daily Mail. 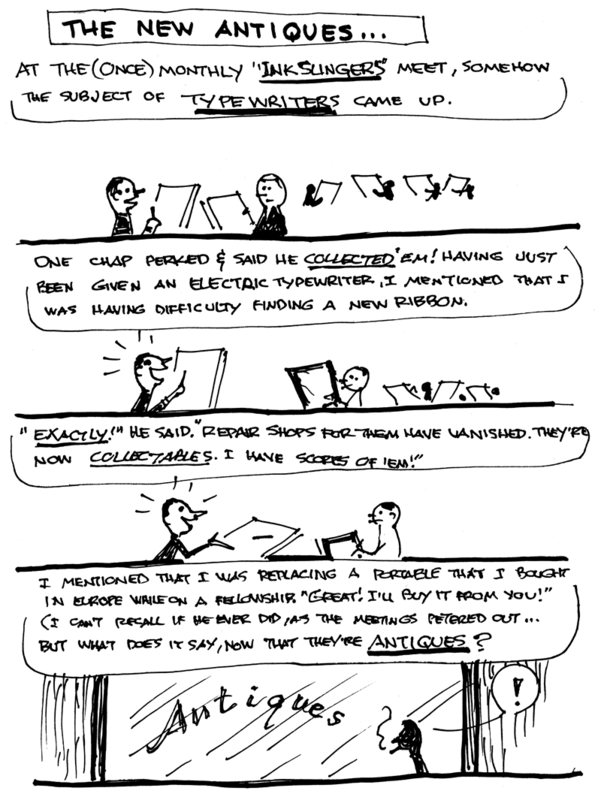 It is the only serial type comic ever bought by that paper. "I'd like my sons to be like Rip Kirby," says Raymond. "You know a lot of comic-strip heroes are pretty icky ... handsome, with strong backs but weak minds. Well, Rip as I see him, is a well-balanced man, a conglomeration of all the likeable qualities I have seen in men I know. He's got a busted nose, but he isn't ugly. He wears glasses without looking bookwormish. He's a former all-America something or other. He's educated, has some sort of a doctor's degree in something and yet you never hear him pontificating about anything. He loves music and is an amateur pianist. He's got a sense of humor and he's got depth. He's only a detective by avocation." Born in New Rochelle, N.Y., Raymond remembers that he had already begun to draw at the age of eight. "I should say that my father's encouragement in those early years as the greatest single factor in my making art a career," he says. "As a matter of fact, he had one wall of his office covered with my drawings and in the evenings he used to settle back in his easy chair and say, 'Draw me.'" "What makes it so wonderful, I think, is that he was a civil engineer and road builder, and had a decidedly scientific mind as opposed to the artistic one. But he had the openness of mind and the vision to see beyond his own business, to realize that art could be a worthwhile career, too." After his father's death, Raymond had to turn down a scholarship to Notre Dame and went to work as an order clerk for a firm on the New York Stock Exchange. From that he changed to a job as a mortgage renewal solicitor. "But," Raymond grins, "I was a lousy salesman. I always believed prospects when they said 'no.'" Out of a job in the big crash, Raymond asked Russ Westover, creator of "Tillie The Toiler" for a job, and got it. 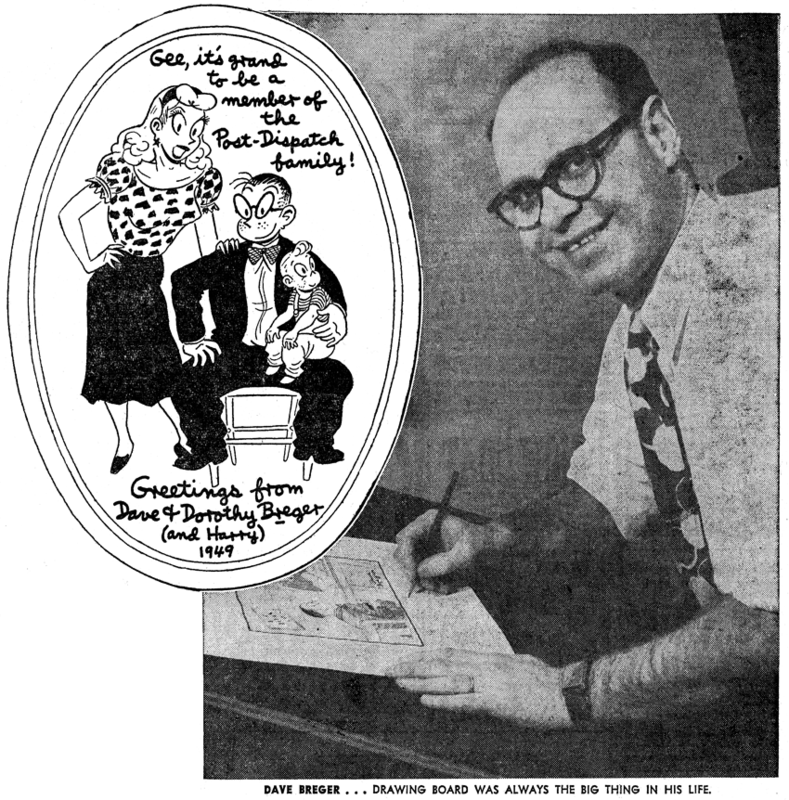 After serving a short apprenticeship with Westover he got a jack-of-all-jobs berth in the art department of the King Features Syndicate in New York and soon was doing a strip called "Secret Agent X-9" for that syndicate. Ambitious and full of ideas, Raymond wasn't satisfied merely with doing "Secret Agent." In a few months he popped up with the idea for "Flash Gordon" and it wasn't long before artists outside the comic field were praising Raymond's drawings, his clarity and brilliance of line and his ability to bring realism and depth into a comic strip. "There was nothing wrong with Flash Gordon," says Raymond. "I still consider Flash excellent escapism." But after drawing Flash for 10 years Raymond was a little weary of it. And besides somebody was blowing a bugle. So voluntarily turning Flash over to another artist, Raymond joined the Marines. Commissioning him a captain, the Marines first sent Raymond to the Corps' publicity bureau in Philadelphia as art director, but by continuous champing at the bit he finally was assigned to the "USS Gilbert Islands" as public information officer and combat artist. He saw action at Okinawa and Borneo; the carrier lay off Tokyo, with the Third Fleet, when it was all over. Pictures painted by Raymond were hung in the National Gallery in Washington and one was selected by General Vandergrift, the corps commandant, as his official Christmas card. Home with three battle stars which he says he wouldn't trade for anything, Raymond was, as he says, "a changed guy." The real heroism he had seen in the war made the razz-ma-tazz heroics of the comic strip heroes look a little silly. He wanted something down to earth and so he produced Rip Kirby, the athletic, intellectual, amiable, scholarly detective who has in a short space of time become one of the most-talked of adventure-cartoon characters of the comic pages. The opening drawing of the strip showed Rip as an officer of the Marine Corps discharged just after having received the Legion of Merit for work done as an Intelligence Officer in the Pacific. 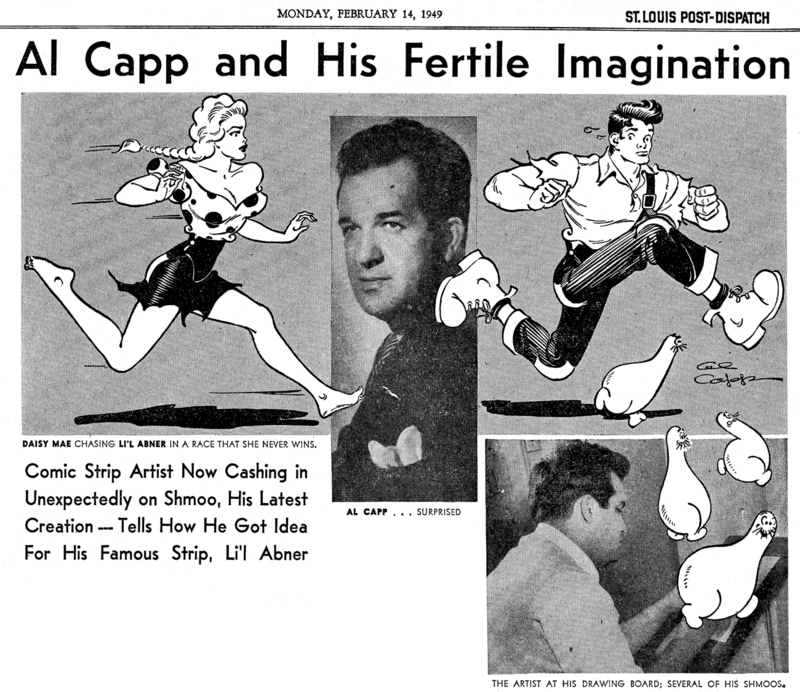 At one point in his career as an artist, Raymond seriously considered abandoning cartooning for magazine illustration. "I finally decided that comic-art work is an art form in itself," he says. "It reflects the life and times more accurately and is more creative. An illustrator works with camera and models. A comic artist begins with a white sheet of paper and is playwright, director, editor and artist at once." Now the father of five children ranging in ages from 16 to 3, Raymond has a comfortable home about 10 miles outside of this little town of Stamford. He divides his drawing time between a studio in his home and an office in town. In the old days I did all my I drawing at home and had little contact with the outside world," Raymond said. "I didn't need the reality of contact to draw Flash Gordon, who wasn't of this world anyway. But when I came home from the war I realized that I needed human contacts, I needed the feel of everyday life to make Rip Kirby a down-to-earth character. And so I work several days each week in town, have lunch with business men, and like it. The war taught me that. There's nothing on earth like really getting to know your fellow human beings." Now 39 years old, Raymond wishes he could make some sort of a deal with his own conscience. When he began drawing, veteran cartoonists advised him that it was both foolish and a waste of time to draw so meticulously. But his conscience keeps him at his drawing board until every detail is settled beyond question. And that today is why Rip Kirby, called by artists and editors one of the best-drawn strips on the market, has 300 papers in the United States and a score more in foreign countries. 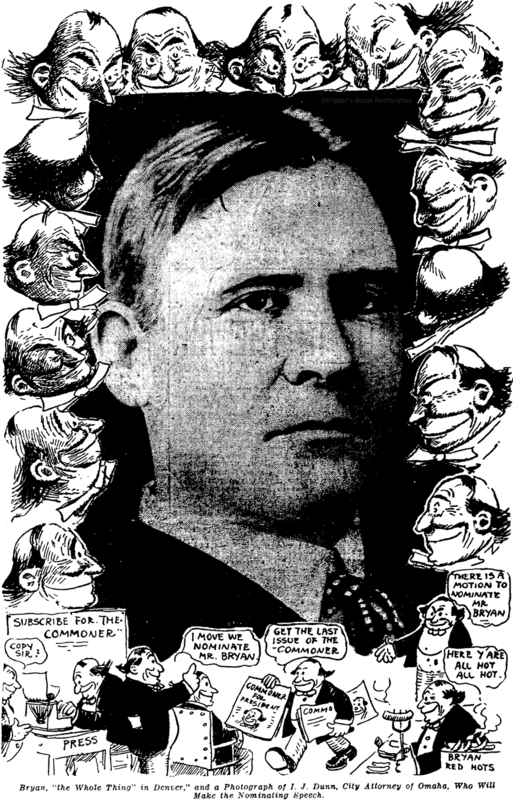 Thanks to Cole Johnson, who supplied a scan of this clipping from the St. Louis Post-Dispatch. This is part 3 of a 5 part series that they ran in 1949. We will be presenting all 5 episodes in upcoming posts. If we're lucky we and the things we bought new will last long enough to be considered antiques.